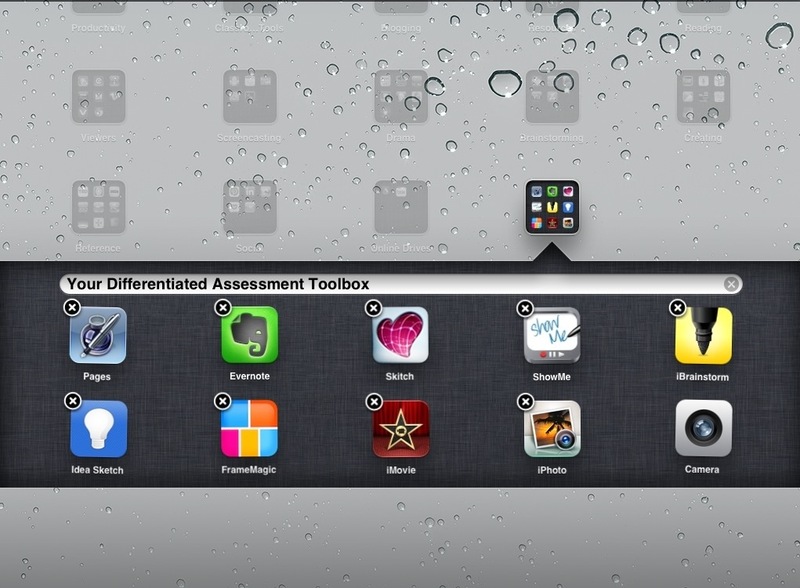 iLearned vs. iLearning: Differentiated portfolio assessment with the iPad? Differentiated learning is at the heart of my teaching philosophy. I believe teachers need to make a conscious effort to embrace all learning styles in their instruction, and to embed these learning styles in their assessments. I also believe the iPad makes doing so much easier, as it has for me. 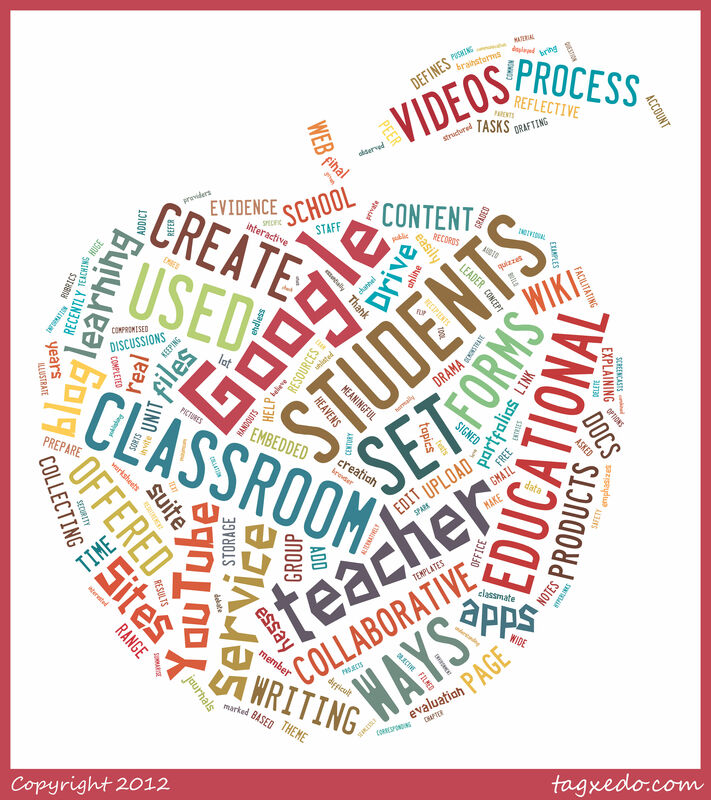 The iPad, and its enormous range of educational apps, offer multiple ways of teaching. Additionally, a very wide range of creation-apps means that students can create and produce content that suits and caters for their preferred learning style. 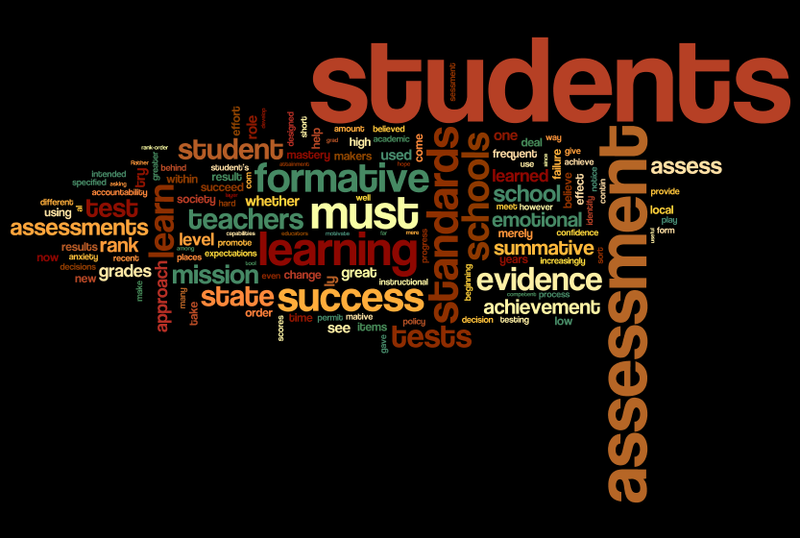 Differentiation needs to be equally embedded in assessment as it is in teaching. Students should be given opportunities to demonstrate their learning in a manner that suits their preferred learning style. Giving students tests under exam conditions is not always the ideal way for many students to demonstrate what they have learned. I have argued in an earlier post that teachers need to make more use of alternative assessments and achieve more of a balance between assessments for learning and assessments of learning (which appears to be a lot more prevalent to me). While my main timetabled subject is Drama, I also teach Humanities, English, ESL and the Business Studies. I would like to see more of the assessment practices used in drama in those non-drama classrooms. I have been making an effort to do so myself in my non-drama classes. Planning : a huge variety of brainstorming and mind-mapping apps can be found in the App Store. My favourites are: iBrainstorm and Idea Sketch. Students collaborate in their groups called ‘theatre companies’ (which work very well for the people-smart/interpersonal learner) to brainstorm for their performance based on the prompt assigned or the task given, and then take screen-shots of their brainstorms to share so that each can document evidence of brainstorming in their portfolios (I use shared notebooks with every student through Evernote). This works perfectly for the more visual learners. 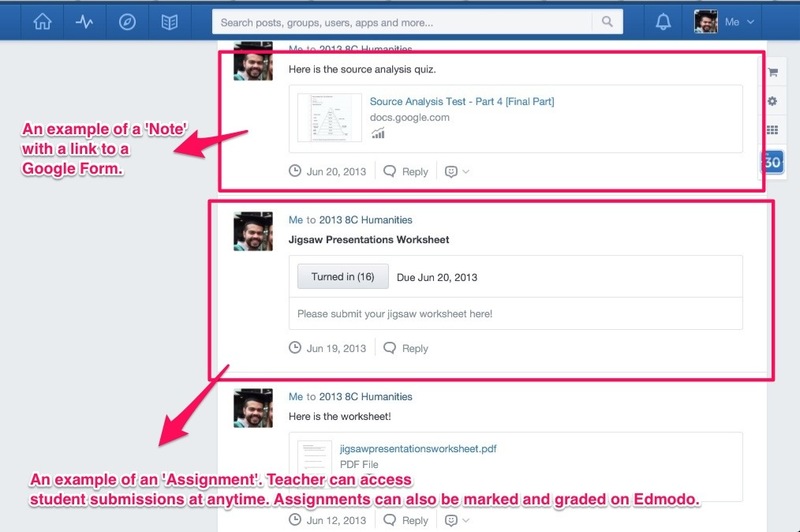 However, some learners prefer to talk during their brainstorms and keep recorded audio clips on Evernote as evidence of brainstorming, or hyperlinks to an uploaded ShowMe where they screencast their brainstorms (works well for auditory/aural learners). Preparing: the second stage of the drama process requires students to transform their ideas into writing a script or preparing a storyboard. Students can use Evernote or Pages for writing (if they are more word-smart, verbal or linguistic learners), or Storyboards app for preparing a storyboard (if they are more picture-smart or visual learners). 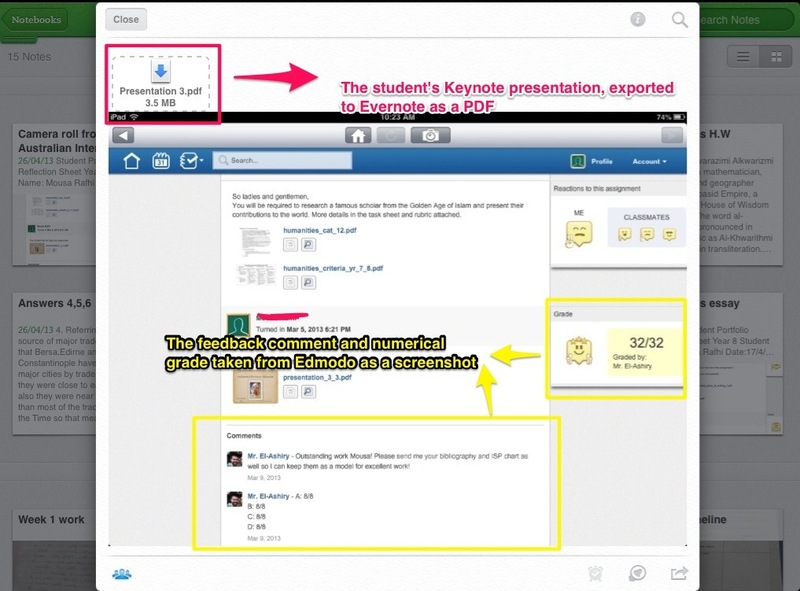 ShowMe can also be used to prepare storyboards where students sketch-and-talk how they will go about their performance. Again, whatever is prepared has to be documented in their Evernote portfolio, whether as a note for their script or an embedded screen-shot for their storyboard, or hyperlink for their ShowMe. Rehearsing: I believe the iPad has been most helpful in this stage. Students use the camera to take pictures during their rehearsals or to keep video footage. Watching video footage of their rehearsal allows them to see themselves (very useful for the visual learner) and facilitate reflection and evaluation (for the intrapersonal and reflective learner), so that they can brush up their performances before delivering them to a wider audience. Pictures can easily be embedded into their Evernote portfolio. 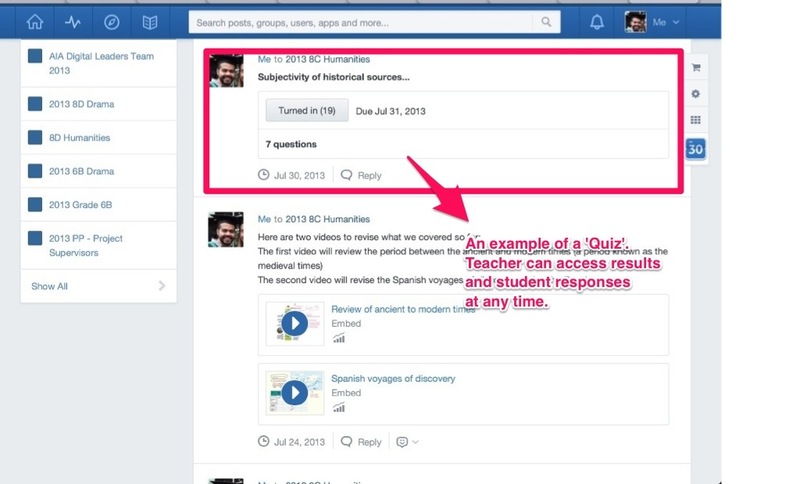 If videos are kept, the students can upload them onto the class YouTube channel and add hyperlinks to their portfolios. Students can also choose to fill-in this Rehearsal Log and either screen-shot it or attach it to a note in their portfolio. Performing: the students are expected to document their performances through taking video footage. These videos are taken primarily to facilitate student reflection, self-assessment and self-evaluation. Students also use these videos to evaluate their peers. Again, those videos can be uploaded on the class YouTube channel and hyperlinked in their portfolios. Reflecting & Evaluating: students are expected to keep record of their reflections, either in written format (for the word-smart/verbal learner), or oral format (for the auditory/aural learner). 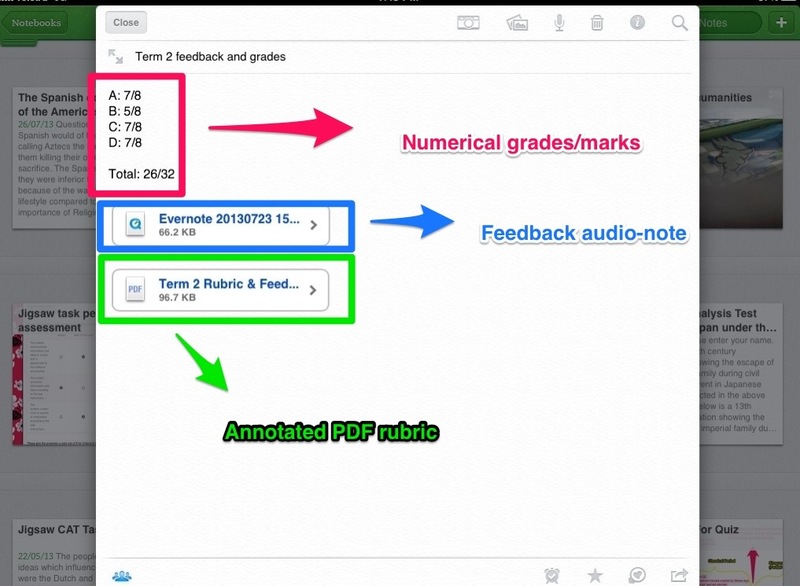 Written reflections can automatically be typed in Evernote, and oral reflections can be recorded and embedded right through the Evernote iPad app. I also make sure there is some sort of structure or framework for reflection, so my students use the reflection help-sheet as their guide. Additionally there are many templates that I use for reflection and evaluation and I can easily share them with my classes through Evernote. 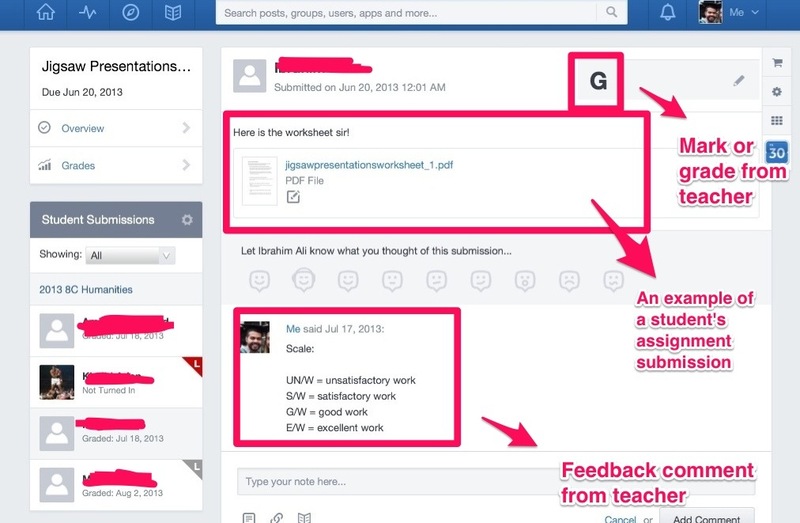 The students can then take a screen-shot of the template and write over it in Skitch, which can then be embedded into their Evernote portfolio. Additionally, there are multiple opportunities for students to create media-rich and authentic content in the classroom, whether they use iMovie to create trailers for their performances throughout the semester, or audio podcasts of tips for actors/directors/writers, or screencasts of theoretical material to teach other students and document their learning, or sound effects and background music using GarageBand, or photo collages of their group work, rehearsals and performances using iPhoto or FrameMagic. While I have described my portfolio assessment practices in the drama classroom, along with my attempts to differentiate to cater for all learning styles, I believe such practices can be replicated in any other subject area. Whether it is video footage of experiments in Science class, audio podcasts of book reviews in English class, screencast videos to explain complex mathematical theories in Maths class, I believe the iPad can be used to differentiate assessment practices. All that needs to be done is to view learning more as a process, and not just the final product, then find ways to document evidence of as many steps of that process as possible. To conclude, I believe the iPad can be used to teach across all levels of the Bloom’s Taxonomy, with a very wide range of opportunities to create (the highest level of thinking on the revised Bloom’s Taxonomy). Additionally, it can be used to differentiate teaching to cater for all learning styles. However, it is not enough to just use it to differentiate our teaching, our assessment practices need to also be differentiated and the iPad can facilitate this differentiation. I delivered a presentation at the ICTEV 2013 conference about this, you can find the PowerPoint I used here. 1- Set clear expectations: a lot of classroom management challenges can easily be overcome by setting clear guidelines and expectations for iPad use. Regularly remind your students of the school’s mobile learning policies and ‘acceptable use’ policies. Communicate your expectations about iPad-use at the beginning of every task. Simply saying ‘I expect you to be working on this app until you submit the work and receive my feedback’ will keep most students on-task. Also, talk to them about trust and how you ‘trust’ that they know what they should be doing. I would also advise teaching a clear non-verbal signal that means ‘put your iPads down and give me your full attention’. Ringing a bell three times, for example, is the signal I use. 2- Let go of control: mobile devices can be distracting and they can empower students to do many things, and that challenges the traditional role of the teacher as the centre of the students’ attention and the main source of knowledge and information. Introducing personal learning devices like the iPad can make learning messier and noisier, but that does not mean that the learning is not happening. Fact is, education shouldn’t be about teacher-control anymore, teachers need to embrace their roles as ‘facilitators’ and ‘managers’ more. 3- Differentiate the task: if a student is disengaged from a task and seems to be easily distracted, ask them for reasons. 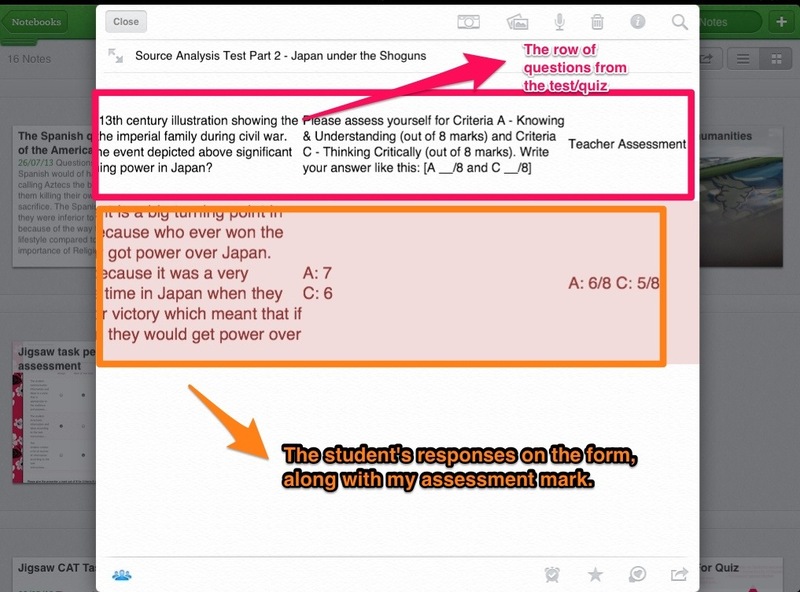 It might be that he/she doesn’t want to type an essay using Pages, but rather prepare a screencast using ShowMe? It might be that they prefer using another app that accomplishes the same thing you requested, not the app you recommended? 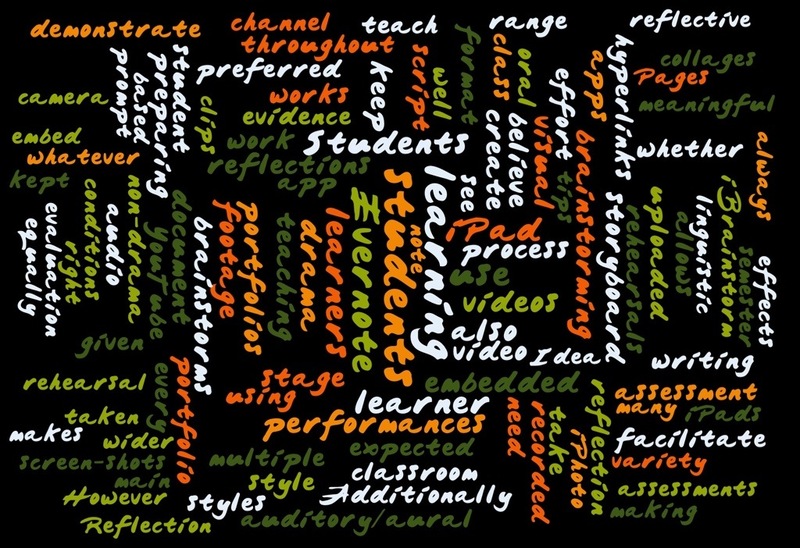 Give the students options and choices about how they can go about and demonstrate their learning. 4- Explore gaming: see how you can bring gaming into the classroom. Students often feel like school content can be very disconnected from their lives. Lots of teachers talk about gaming as just a waste of time, but fact is there is research that proves the value of bringing gaming into the classroom. Use different characters in games and their voices/body language to get students thinking about characterization in drama, and the elements of a narrative (as a lot of games are based on a story). Think about how ‘Angry Birds’ can be used to teach some concepts in physics. Use scrabble-like games in English classes. Whatever the subject, I’m sure you can find one or two games to relate. Additionally, those games need not take up the whole lesson, they could just be quick warm-ups or even rewards for students who finish early but still produce high-quality work (i.e. whose work is not just rushed so they can play games). 5- Assign group roles: the iPad is meant to encourage collaboration, and I am a big proponent of collaborative learning. When I run a lesson that requires the iPad, I design the task so that only one group member needs their iPad, then I would rotate that group member in consecutive tasks (so that other students also get to use their iPad). For example, in a brainstorm task, I would give the questions to the group and ask them to brainstorm on a poster paper (to be hung up in class) while one group member is responsible for reporting the group’s findings on a typewith.me pad or Google Form. Additionally, you can pick another group member to visualize the brainstorm on a mind-mapping app. It’s easier to manage an iPad classroom when only a few students are holding the iPad at a time, not the whole class. 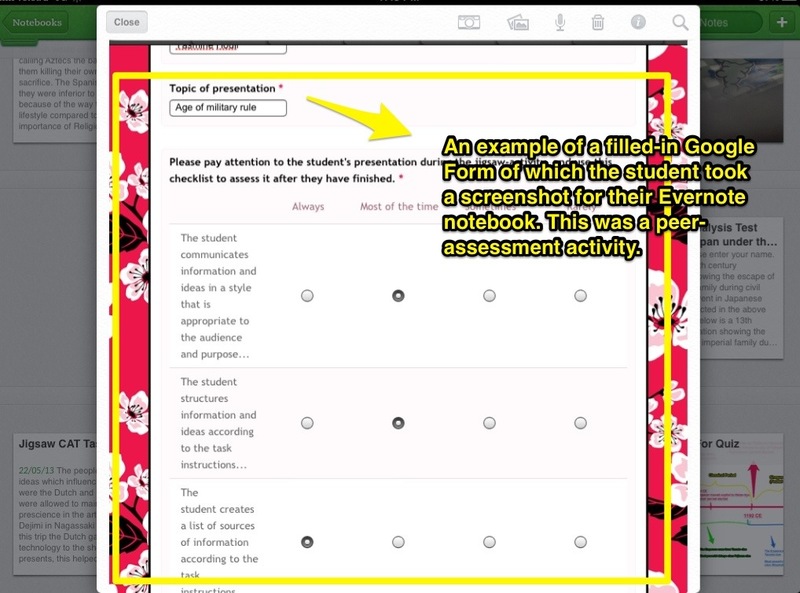 See if you can design tasks where all group members can work on different stages using their iPads. For example, one group member brainstorms with the group using their iPad. The next group member is responsible for taking photos and documenting rehearsal. The following group member is responsible for shooting video of the performance and uploading it on the class YouTube channel, and so on. 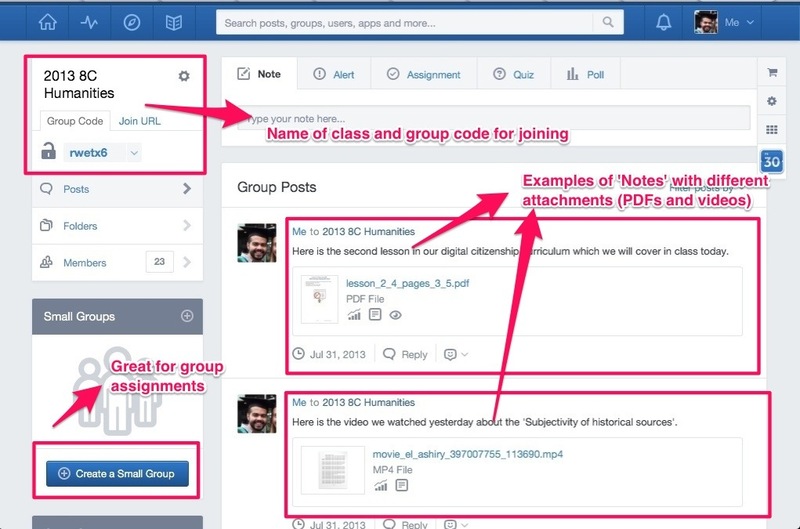 Each group member is also responsible for uploading or embedding the evidence they collect onto the group’s shared blog or Evernote shared notebook, or any other form of group portfolio, so that they can all have the same evidence to document their learning. 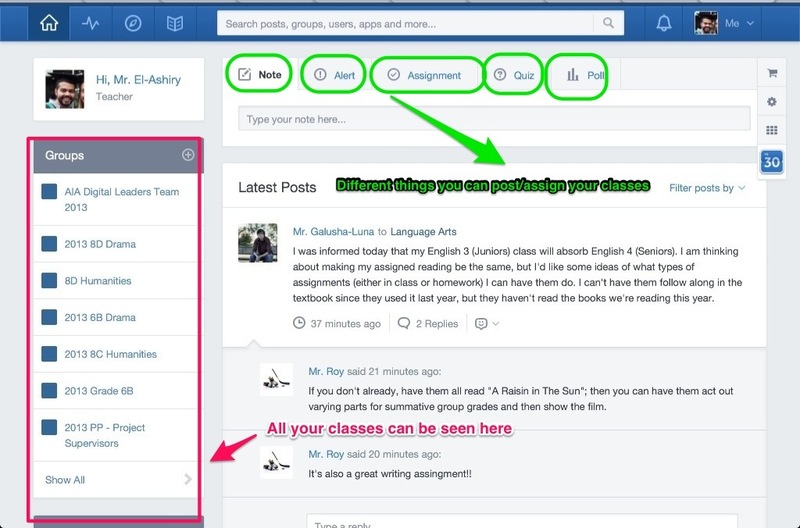 Also, you can design the task so students each work on a part and pass one iPad around, while doing something else when they are not holding the iPad. I have found that it is easier to manage the class and ensure that they are on-task when I can only see five or six iPads around the room at a time (in a class of 25 students). 6- Circulate around the room: I have seen many teachers who like to teach from their desk. I personally believe this cannot be done with iPads in the classroom. I believe the teacher must walk around the classroom and circulate often when students are working individually. That gives the students the idea of ‘teacher-with-it-ness’ and encourages them to be on-task. 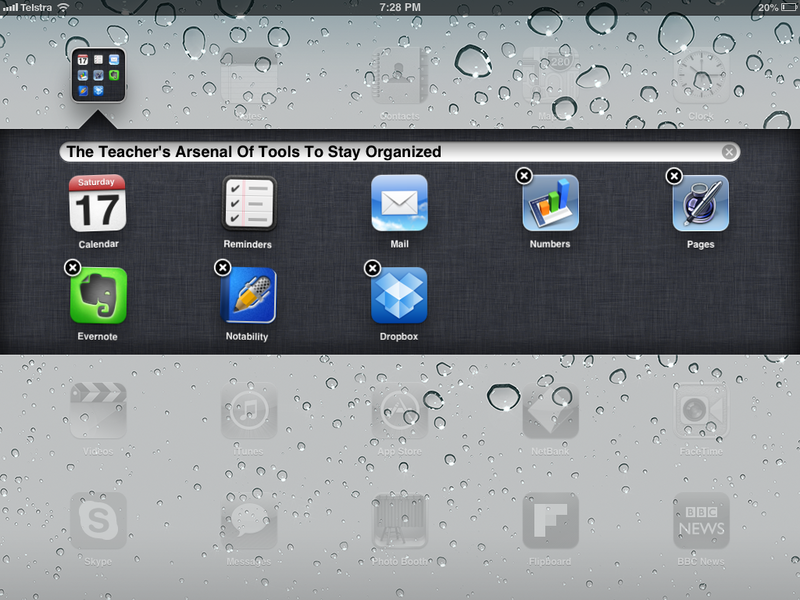 Also, arrange the classroom in a way that allows all or most devices to be in view. 7- Prepare backup plans: last semester, I designed a really cool rubric using Numbers (the spreadsheet app). The students were to use this rubric to assess themselves. 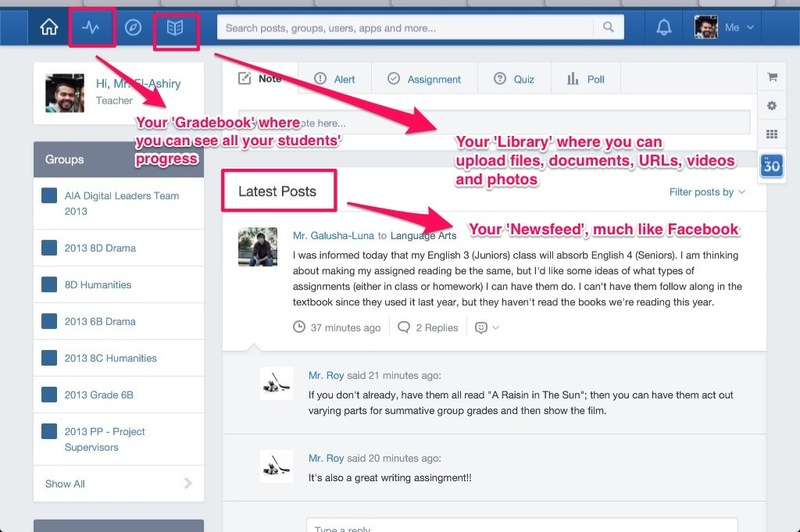 I uploaded the file on Edmodo, shared it with the class and thought everything was under control. However, many students couldn’t open it because it required the latest version of Numbers, which many of them didn’t have (students don’t always regularly update their apps and their iOS software either). Luckily, I had a few printed copies. Technology does let us down sometimes. The most important thing is: don’t panic in front of students and relax, show them that you control the technology, not the other way around. 8- Use games as an incentive: many teachers I meet disagree with this approach, but I still firmly believe in it. We have to teach our students that there is a time for work and and a time for play, and we need to model that in our classrooms. I always tell my students that they can have free-time to spend on their iPad when they finish their work and it is of ‘high quality’. That ‘high quality’ disclaimer is to encourage them not to rush to finish the task, and it reserves room for your judgment on the quality of their work. I often try to find one or two things they can do to improve their work first before allowing them that free time on the iPad, or even nicely asking the student who finished to help another struggling student for a few minutes first before getting free time. 9- Teach responsibility: ultimately, we need to teach students to be responsible for their own learning. Mobile devices empower the students with a lot of tools that can be useful for learning, but at the end of the day, they have to make the choice of learning or not. I constantly remind my students that ‘I’m responsible for my own teaching, you are responsible for your own learning’. Talk to them about making choices and the consequences of these choices. If they allow themselves to get distracted, ask them to give suggestions for helping them stay on-task, so they feel they have more responsibility over the situation. To conclude, managing a classroom that uses iPads or other mobile devices presents challenges that are different to traditional classroom challenges. I am constantly seeking suggestions, ideas, and practical tips from other teachers, so please feel free to leave a comment. Happy iPad-ing! 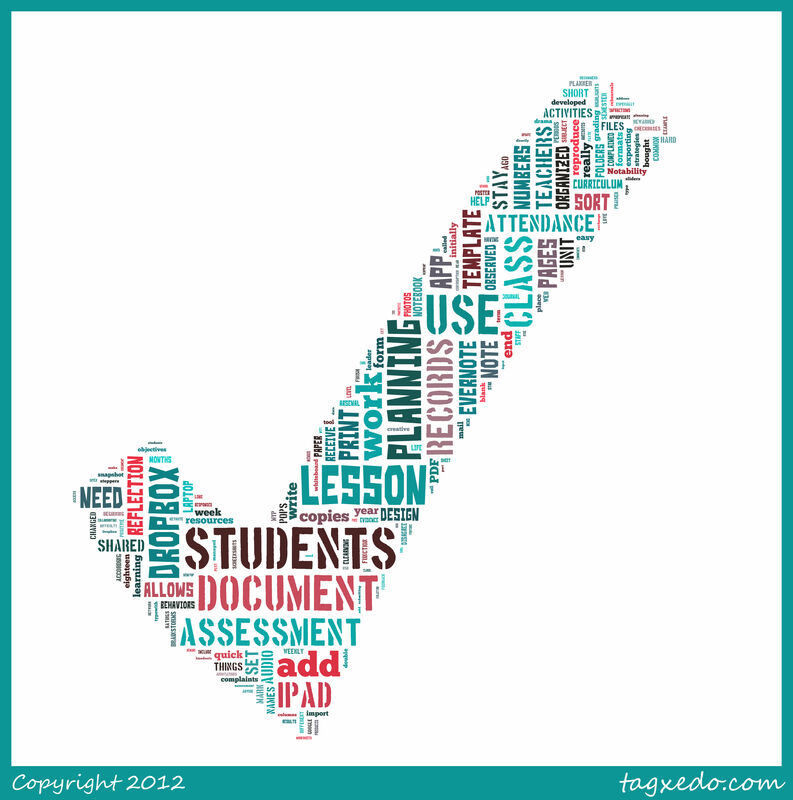 Student self-assessment: capitalizing on its benefits? 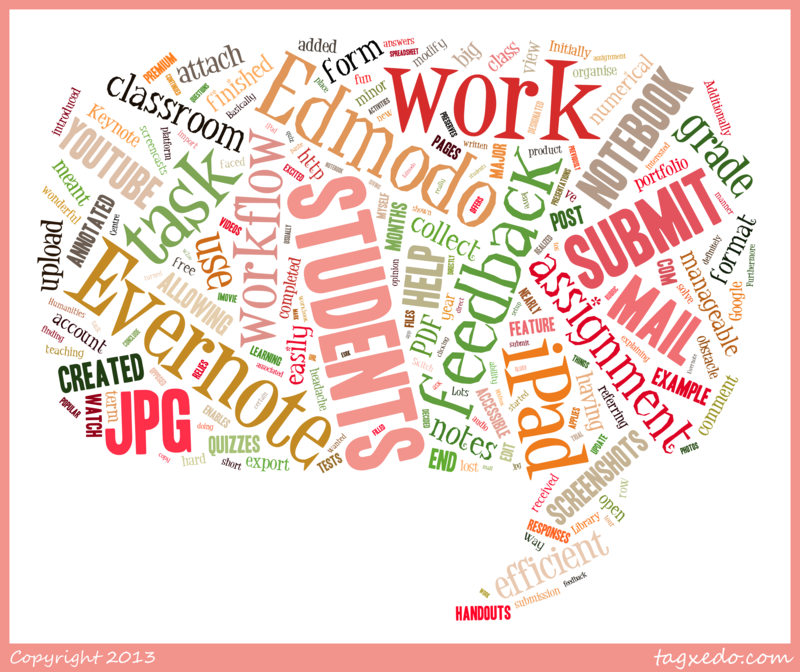 Assessment is a recurring theme in my blogging. I think that is because it was my biggest challenge when I started teaching. I wrote before how I thought that teacher-training programs do not prepare us sufficiently for our role as assessors as they do for our role as teachers. This blogpost will focus more on self-assessment and how I came to use it in my classroom. I am now a lot more comfortable with my use of student self-assessment in class, but it didn’t start as such. I would also like to invite other educators to comment and suggest other ways to fully capitalize on the benefits of student self-assessment. The context is a unit of work on improvisational theatre for my year 7 drama classes. I always post the main content on the board for every lesson (imagine writing this four times a week for about six weeks!). 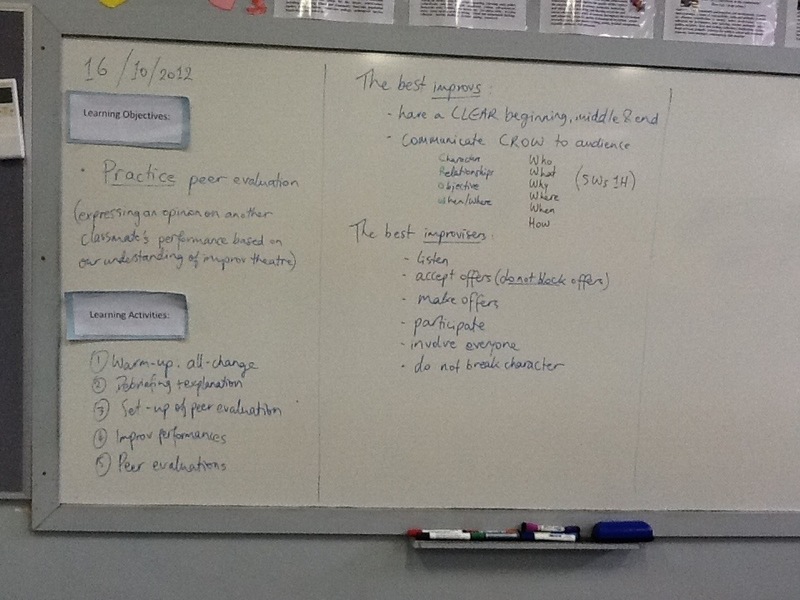 Below is a copy of the whiteboard with the main learning material posted on it. Basically it is a simplified list of the features of the best improvisations and what the best improvisers do. We refer constantly to those two lists when the students give each other feedback on their performances, and when the students assess and evaluate their own performances. 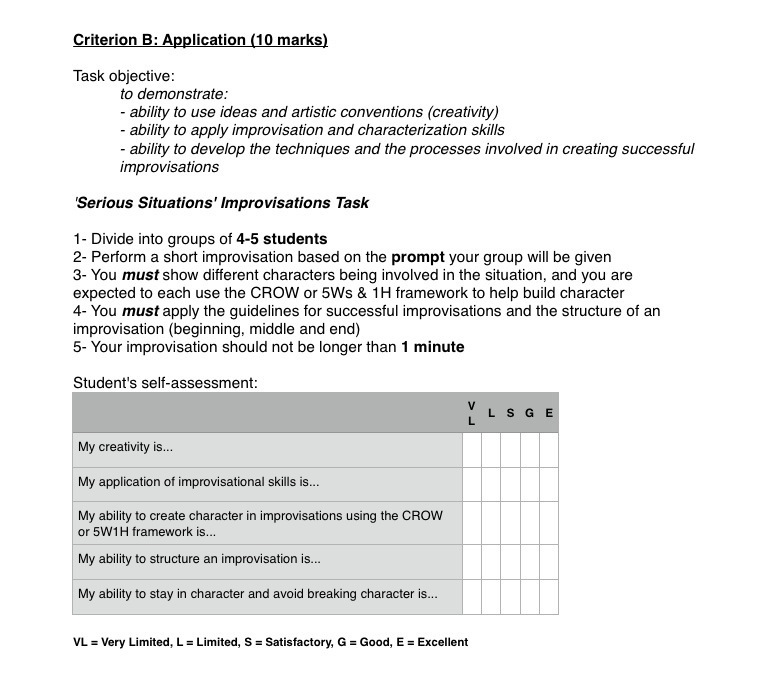 After having practiced improvisational skills for about five or six weeks through playing various improv games and theatresports, the students are given this task sheet that will be used to assess Criterion B (Application). They are told that this MYP Arts criterion is used to assess ideas, skills, techniques and processes. The students are then given a prompt for their improvisation, and the performances are filmed. After all performances, the students watch the video of their improvisations and then use the checklist in the task sheet to assess their performance. 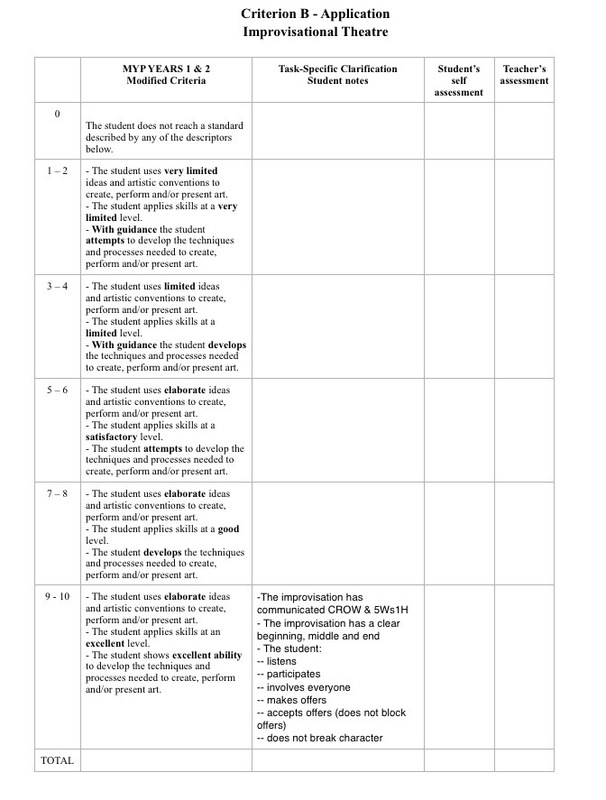 The last step required of the student is to use the self-assessment column in the rubric below to give themselves a mark out of 10 for Criterion B (Application). Last year, this process was already in place for me. However, I didn’t really know what the next step should be. I didn’t know how to fully bridge the gap between the student’s self-assessment and my own teacher’s assessment of their work. I did a lot of reading and professional learning on assessment, and I finally came across a fantastic alternative assessment tool: conferencing with the students. It seems very common-sensical, but in actual fact it wasn’t for me. What I learned to do after the students use the checklist and the rubric to assess their work, is to conference with each one of them. I use this 2-3 minute chat (which I build into class-time), to probe further reflection. I ask questions such as: “Why did you give yourself this mark? 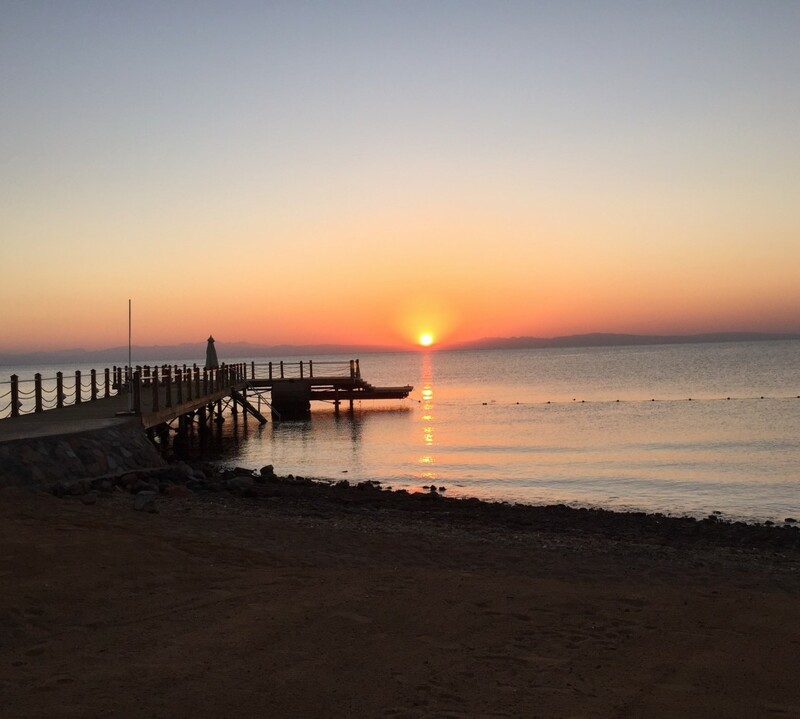 What suggestions for improvement do you have for yourself?”. I also constantly remind them to refer to the guidelines for successful improvisations/improvisers written on the whiteboard for their oral reflection during the conferencing. Students are often (though not always) quite capable of evaluating their own work and formulating their own feedback for improvement. Of course, you will come across the students that under-assess themselves and those that over-assess themselves. I always remind the ones that under-assess their work that they are being too hard on themselves and focus on highlighting the positive aspects of their work. I also probe further reflection from those that over-assess themselves and ask them to see how they can improve. Using their performance, checklist, rubric self-assessment and the conference, I finally arrive at my own teacher-assessment, which I add to their rubric in the teacher assessment column, reminding them to use this discussion in the conference as their feedback for improvement. I am now much more comfortable with the way I administer the task and assess the students, and with the way I allow students to assess themselves and evaluate their own work. However, I believe there is always room for improvement. I would like to invite teachers and educators to share their thoughts, views and suggestions.